I never rode like this and don't know these kids, but the helmet and padding look accurate to the time. I've lately had strong memories of what it was like to be seven-years-old. That was the year I got my first bike. A box containing a blue bike appeared in the TV room a few weeks before my early April birthday. Dad said it was for my cousin in Idaho, whose baptism we planned to drive north for soon. 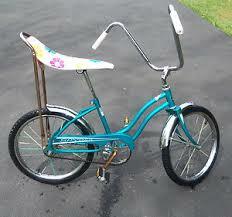 But it was a powder blue girl's bike, so I was pretty sure it wasn't for Russell. When we headed to Idaho without it, I knew it was mine. There was a wait before I could learn to ride because it was a snowy spring. I'm sure my parents must have helped with the first attempt, but all my childhood bike memories are of riding on my own. I remember learning in my Grandma's field, which sloped slightly downhill. Momentum and gravity kept me upright long enough to practice balance for a while before falling over. Falling isn't a big deal at seven, and nothing could beat the wild feeling of speed so I did that over and over until I could ride. I don't remember ever riding that bike anywhere other than in the yard. The convenient park across the street would be an empty field for almost twenty more years. Our road was/is narrow and winding and dangerous for biking and my mom did not believe in letting us wander around unsupervised. Though I'm sure my folks sometimes drove me up to the newly built elementary school or the church parking lot, it is the field and the driveway I remember. The driveway was dirt and gravel and ran downhill from our garage to Grandma's house. On one early attempt at control, I crashed into my uncle's work truck and knocked off my front reflector. Apparently, I scratched or dinged the truck too, because my parents heard about it. 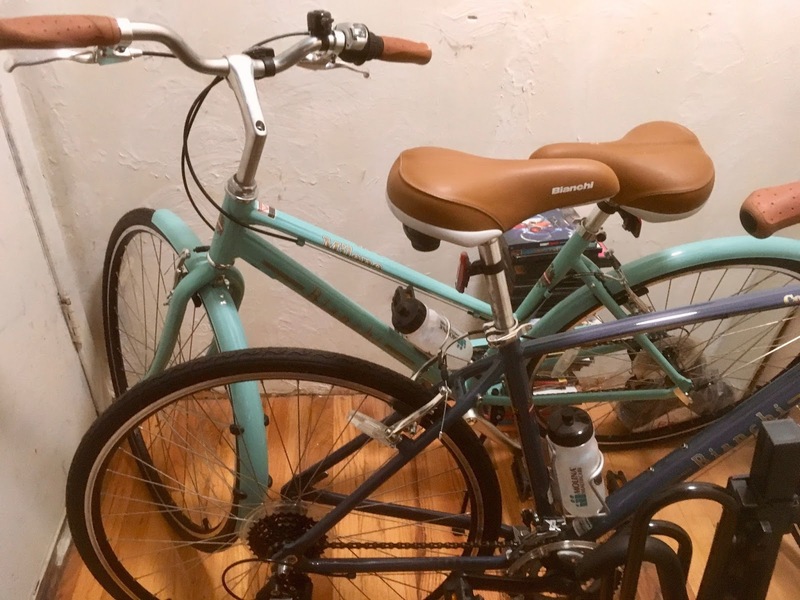 It was my ten speed, also powder blue, though this time a sleeker-looking boy's bike, that brought me a degree of freedom as well as speed. I'm not sure which birthday brought this grown-up bike, but I was old enough to go on my own (with permission) to visit friends and attend church activities. It also brought new challenges. I had to learn how to use hand breaks to control myself on our steep hills. I had to figure out how to shift down to climb those hills. I also had to figure out how to get on the bike and get started. I couldn't reach the ground from the seat. My preference was to start next to a curb so I could have one foot on the ground as I pushed down on the opposite pedal to start. 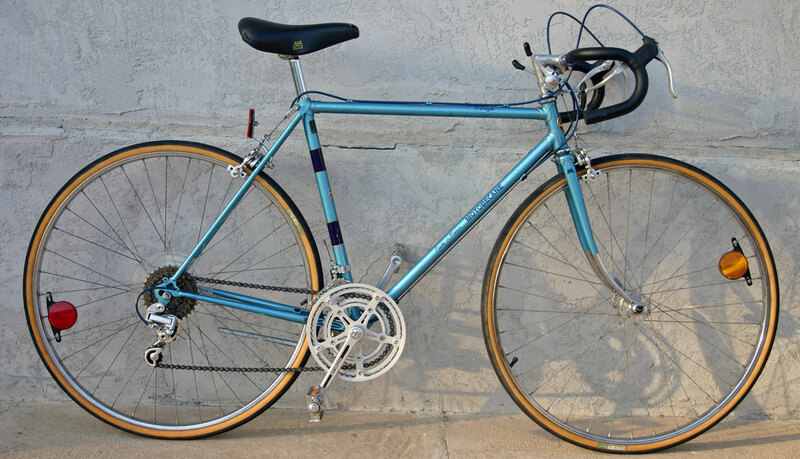 I only remember one fall on the ten speed. Too close to the edge of the road, one wheel dropped off the four inch difference between pavement and shoulder and I went down. 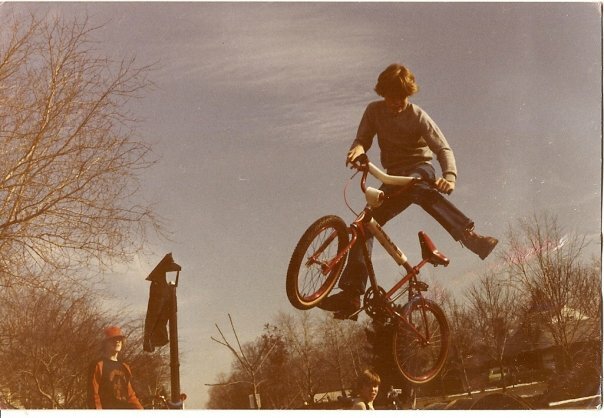 There was no real damage to me or my bike, but I remember this as scary and painful. Apparently even thirteen-year-olds fall less easily than seven-year-olds. By high school, my activities were even further from home and my mom was relieved when she could let me drive to all the lessons, school activities, and 4-H meetings. My bike was effectively retired. More than thirty years later, my sweetheart started thinking about getting bikes so we could explore the Jordan River parkway further than we can on foot. I was nervous, but don't want to discourage any adventures. Besides, our April birthdays were months away. But in March, it really happened. We went into the Cottonwood Cycle to look around, but quickly became customers. Choosing my bike was love at first sight. Officially "green" (yes, I've heard the whole story) my blue bike matches my hair and caught my attention immediately. I patted its seat and handlebars and admired its beauty as my husband did all the bike shop business. Our bikes are mostly indoors hiding from spring rains. 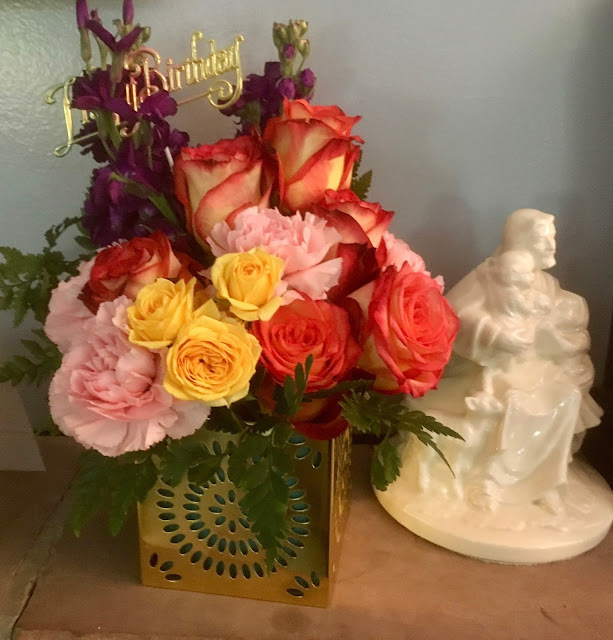 My birthday was Thursday (That's my excuse for a late blog too.) Despite frequent rains, we have been out on the bikes three times. This is the first time in my life I've worn a helmet and probably the least likely for me to need it. We plan to ride on nicely paved bike trails away from traffic. I'm 49 this year and hope not to fall at all on this bike. 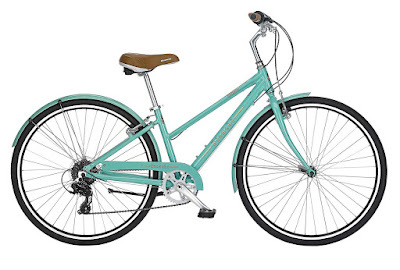 That was my thinking when I decided on a "girl" bike again. I can quickly put my feet on the ground if I have to. The other advantage I have discovered is in mounting the bike in the first place. I can almost lift my leg enough to get on this bike, but I still need to turn it sideways to lower things a bit. Despite being an old lady, once I get started, I am seven again. I feel the same thrill over the slightly out-of-control sense of speed, the same roller-coaster-fear on a tight turn, the same sense of freedom. I'll catch up on the knitting news next week, but should share the podcast. My husband is amazing, so in addition to a bicycle and dinner, he got me a beautiful gift of flowers. Coincidentally this week's podcast is about poems Emily Dickinson sent with gifts of flowers. You could make my day by subscribing to my (usually very short) podcast by looking for Poem Moment on either Podbean or iTunes. I love your bicycle. Bicycles have been my salvation for years both before and after RA. I know you will love exploring this summer. Sheryl and I love riding our bicycles around our neighborhood and occasionally beyond. So have fun. Thank you. We have good weather this week, so I'm looking forward to getting out and getting stronger. 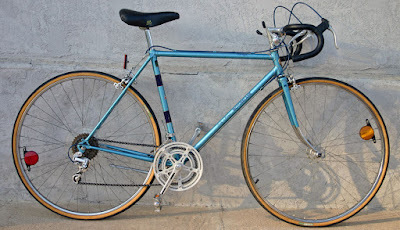 This is the best blog i have ever seen.It has a Nice packages about road bikes and the details about bikes are good.